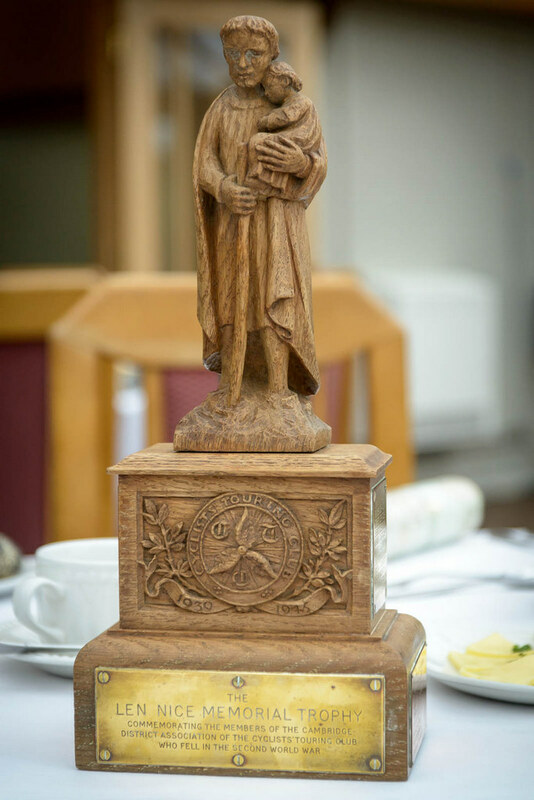 George Rich writes: The Len Nice Memorial Trophy is a good wood carving of St Christopher on a base which bears the CTC's 'winged wheel' badge. It was paid for and donated by club members just after the the 1939-45 war. It commemorates those club members who lost their lives in the war." Len Nice was a well-known and popular member of the club during the 1930s. He was called up at the outbreak of the war and joined the Cambridgeshire Regiment where he reached the rank of lance-corporal. He was sent out to Singapore where he was captured by the Japanese. His captors put him and many other prisoners on a ship, the Hofuku Maru, and sent them off to Japan for slave labour. However on the way, on 21st September 1944, their ship was sunk by an American Submarine. Almost everyone on board went down with the ship. The handful who were picked up by the American submarine did not include poor Len. He's listed in an online Roll of Honour. More information can be found in the book "Line of Lost Lives" by J.S Cosford (reviewed here). When our late President William Claydon (Donnex) died a few years ago we lost the last member who knew and rode with Len.